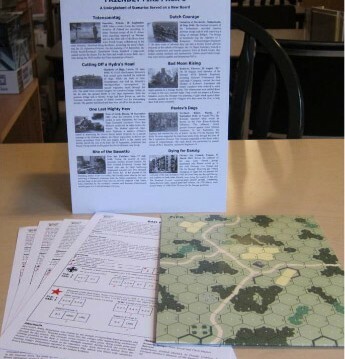 The sixth iteration of Friendly Fire’s annual scenario pack shows its continuing evolution as well as its continuity. The evolution is most marked by its growing international nature. Though Swedish ASLer Mattias Rönnblom maintains its Scandinavians roots with four scenario designs, the remaining four scenarios are designed by the international designing duo of Peter Stuijf (Netherlands) and Chris Mazzei (Switzerland). Playtesters and proofers come from a variety of countries, including Sweden, France, Germany, Great Britain, Australia, and a whole host of Americans. 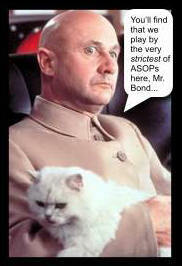 The only thing missing is Ernst Blofeld, stroking a cat. The continuity, on the other hand, comes from the dedication of the publishers, from wherever they might be, to put out a quality collection of accurate and fun scenarios. This has remained constant throughout the six-year history of Friendly Fire, and the sixth pack is no departure from this welcome norm. 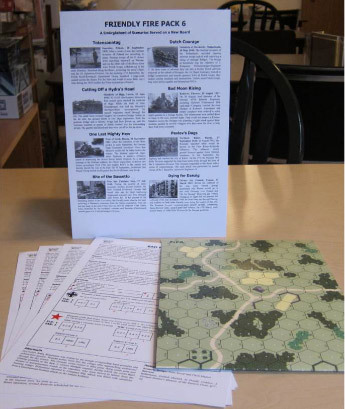 One thing is different in the sixth friendly fire pack, though, and that is the appearance of a geomorphic mapboard. Previous packs have been nothing but smallish scenario packs–eight scenarios and nothing else (although Mattias Rönnblom has sometimes made some small numbers of homemade counters, typically for purchasers of the product at ASLOK tournament in the United States and the Linköping ASL tournament in Sweden). This time around, however, a nicely-made unmounted geomorphic mapboard (dubbed FrFA) is included in the pack. The map is well done, and not much beyond a certain generic-ness to the buildings would suggest that it was not an “official” geomorphic mapboard. The map, though nice, does not exactly break much new ground, however, depicting mostly a small crossroads hamlet surrounded by some patches of woods and some grainfields (as well as a single crag hex, looking out of place as if it wandered into a gay bar by mistake). In any case, it’s a nice extension of Friendly Fire capabilities and perhaps future maps will add a bit more to the oevre than this one does. 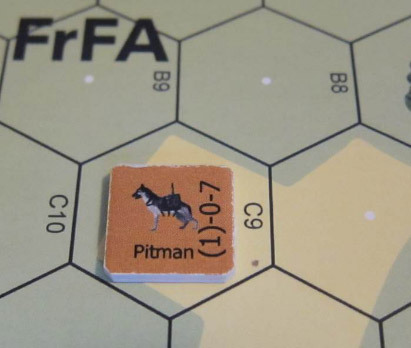 Four of the pack’s eight scenarios use the new Friendly Fire board. FrF46 (Dutch Courage) uses an ASL Starter Kit board, board t, as well as one of the newer geoboards, board 57. The eight scenarios depict a range of actions, including Soviets vs. Germans (Soviet Union 1941 [3 scenarios] & 1942, Poland 1945), Poles vs. Germans (Poland 1939), Dutch vs. Germans (Netherlands 1940), and New Zealanders vs. Germans (Italy 1944). As noted, East Front and early war West Front scenarios predominate. The PTO is nowhere to be seen (one would think that Northern Europeans would flock to that warmer clime). The scenarios are overwhelmingly small or medium in size; only one really aspires to be large. Basically all of them are tournament-playable. No scenarios use Air Support or OBA; one scenario uses Night rules. Most of the scenarios depict interesting situations. Perhaps the most unusual, in a sense, is FrF50 (Pavlov’s Dogs), because in addition to its standard Germans-attacking-Soviet-settlement fare, it portrays Soviet mine dogs. These bomb-laden woofers, trained to seek out German tanks, are treated basically as 1-0-7 tank hunter heroes. The Soviets can create a whopping 10 Mine Dogs during the scenario; a veritable kennel’s worth. Because of an SSR that greatly increases creation chances during turn 1, combined with German set up restrictions that make some of its AFVs vulnerable, turn 1 of most scenarios will see a barrage of barking bombers lunging at German AFVs and dodging fire from accompanying German infantry. In a way, this is almost a fun preface or, if you will, appetizer, to the main course of the scenario. 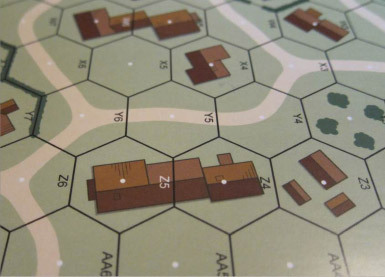 Because the victory conditions allow the Germans to win immediately upon controlling a certain number of building hexes, the scenario itself can create some tense and suspenseful moments. 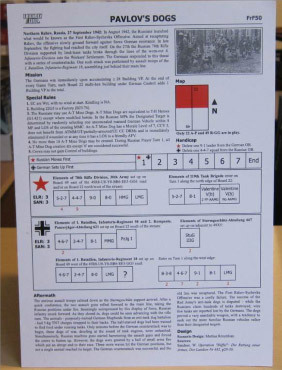 Handmade Mine Dog counters were included in some copies of the pack available at early tournaments, but are not included in most copies. The names of the dogs included several ASL personalities; a subtle bit of tail-wagging. Another nail-biting scenario is FRF51 (Bite of the Bassato), a small scenario that could easily see a lot of tournament play. In this scenario, a tiny handful of elite German squads and a single StuG 105/25(i) must survive an onslaught of elite New Zealanders with a trio of nasty armored cars (Staghounds). If they can survive until turn 3, they get a platoon of reinforcements, as well as a StuG75/34(i). Until then, however, the Germans must hang on for dear life. The knowledge of imminent enemy reinforcement also puts a considerable pressure on the New Zealand player to make hay while the sun still shines. Some players will inevitably gravitate towards another scenario, the somewhat larger FrF52 (Dying for Danzig), largely because the attacking Soviet forces have two flame-throwing tanks. If they can dodge the German 88mm AT gun, those tanks can put the fear of godless communism into the defending Germans. Another scenario, FrF46 (Dutch Courage), employs a VC mechanism that isn’t used very often in ASL, but when it does, can also put pressure on the players. In this scenario, a force of German paratroopers, well led and armed, must seize buildings from a weaker group of Dutch defenders and hold those buildings against subsequent Dutch counterattacks. The Dutch are green but numerous. Every game turn, the Germans get VP for each building they control (of five); thus a building seized early can provide more VP than one seized only later. Similarly, the Dutch counterattackers cannot afford to be too cautious in their efforts, as the longer it takes for them to retake buildings, the more VP the Germans will accrue. The Friendly Fire folks must be commended for coming up with a new set of interesting scenarios every year. Fresh situations, fresh units, fresh SSR, fresh VC, or some combination of the above seem to flourish in Friendly Fire scenarios every year. They currently represent some of the best cardboard bangs for the buck in ASL play; one can only hope that they do not get cocky or lazy and decide to rest on their laurels.